Daily Illuminator: The 2012 Munchkin Coin Is. . .
December 17, 2011: The 2012 Munchkin Coin Is. . . 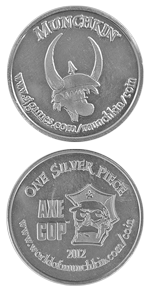 The 2012 Munchkin Silver Piece features the newest addition to the Munchkin universe: Axe Cop! Released in November, Munchkin Axe Cop is based on the hit webcomic written by Malachai Nicolle (age 5) and drawn by his brother Ethan (age 29). How can you get your hands on the new Munchkin Silver Piece? If you place an order right now through Warehouse 23, we 'll include it free! The coins will also be available from MIBs and our staff at conventions and demos during the year . . . until we run out. The new rule for January 2012 will appear on the Munchkin Silver Piece web page soon. Be sure to check back to see what bonus the coin will give you in your next Munchkin game!